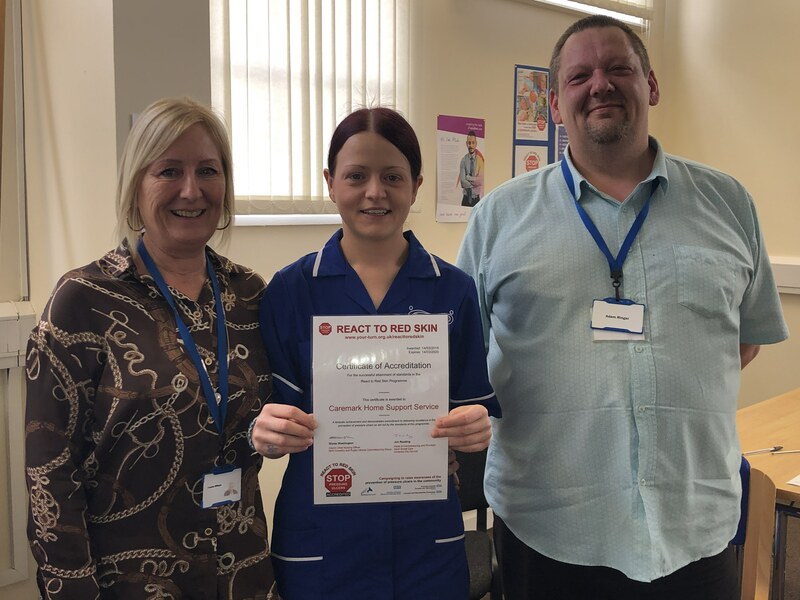 Caremark Coventry, an in-home care provider who care for clients throughout Coventry and Warwickshire, has been accredited by Coventry City Council with ‘React to Red’ status – a campaign committed to communicating the dangers of pressure ulcers and the simple steps to avoid them. Caremark is the first in-home care provider in the Midlands to be accredited. Pressure ulcers, which can often be avoided through the proper education of their management, cost the NHS and regional care organisations around £6.5 billion every year. In a bid to reduce the dangers faced by those in the community who are prone to ulcers, Coventry City Council, along with regional commissioning groups and the Care Quality Commission, launched the ‘React to Red’ campaign. In short, this long-term strategy hopes to reduce the number of avoidable pressure ulcers being recorded in the community. Care providers are trained to recognise the early warning signs that a client might be developing an ulcer and what to do in that instance. Care professionals who undertake the ‘React to Red’ training scheme are also given simple steps they can take in order to help reduce the risk of an individual developing a pressure ulcer in the first instance. In an effort to encourage all domiciliary care providers to implement the system, Coventry City Council approached Caremark Coventry and suggested the office pilot the in-home care system in the area. Amanda Williams, Operations Manager at Caremark, was delighted to work with her team to ensure the pilot was successful. Since piloting the programme, all clients involved in the trial have been ulcer free for three months, directly reflecting the objectives of the campaign. Following a successful pilot, Caremark plans to roll the system out to all their clients in the West Midlands in the coming months. In addition, the React to Red training scheme has been incorporated into their induction programme, with all staff and care workers qualified to administer the specialist scheme. Eager to communicate the benefits of implementing the system, Amanda has offered to deliver workshops with other care providers, allowing them to implement the programme with their own teams. Image attached – Some of the Caremark team with the official accreditation certificate. From left to right - Amanda Williams, Operations Manager, Sophie Cooper, Team Leader and Adam Ringer, Training Manager. Caremark is the UK's largest privately owned care franchise with a turnover of £65m. We are a leading home care provider with over 100 offices in the UK and Ireland. We support over 6000 customers and employ more than 5400 carers who deliver on average, over 96,000 hours of care, every single week, across the UK. Established in 2005, we are proud to be a wholly UK owned and operated home care franchise which has an established and successful UK based network. 43% of Caremark franchisees are female, which is almost double the national franchising average. It's a figure we are really proud of. Not only that, but a large proportion of our management team are women, including our Managing Director, Finance Director, National Operations Manager and National Training Manager. The UK has an ageing population which is estimated to grow some 58% in the next 20 years. As the demand for more complex and highly professional levels of care increases, we continue to provide a quality service to those in need of help and support. There is also a developing awareness that care at home can benefit not only those individuals in need but the hospitals and other organisations that are also responsible for looking after them.